I have no doubt that my recent surge in watercolor activity is due to the fact that I have three days remaining before school begins. I know that my best intentions are not to allow school to cut into my production, but frankly it happened this summer (though I’m pleased to find out that I did actually complete 21 paintings this summer) and it will probably happen again once the school year moves into full swing. I am fascinated with the complexity of the facade of this Trinidad, Colorado building. 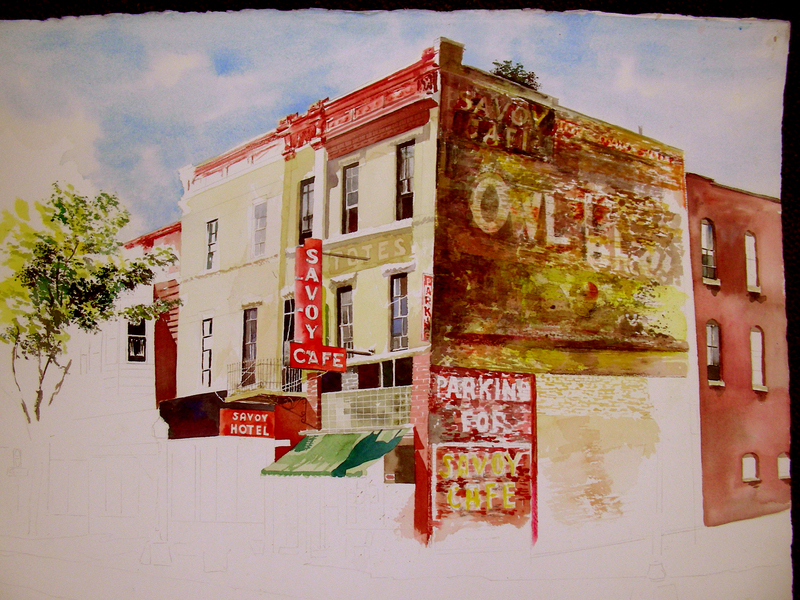 Today I began working on the tree foliage and the upper story windows and brick textures. The ghost signage is still getting plenty of my attention as well, as I try to darken the shadows and make the bricks more distinct. Work on this building is coming along very, very slowly. I resumed the ghost signage on the side wall of this hotel late last night (and stayed up till nearly 3:00 a.m.). Today I am back at school, getting my classroom ready for the students next week. But I hit the wall around noon, and decided to take out this painting (which I conveniently brought with me) and push it a little further. I have begun work on the tree to the left, three more windows have been added, and now I am trying to work on the fascia details running along the roof. Contrast has been a problem on this composition from the beginning. Last night I began taking daring steps to darken particular portions of the building, and today I have pushed them even further. I always have a problem rendering the ghost signage, but I do love it so. I cannot stop staring at it in real life, cannot stop photographing it, and after all these years am still flummoxed by the task, nevertheless I continue experimenting. 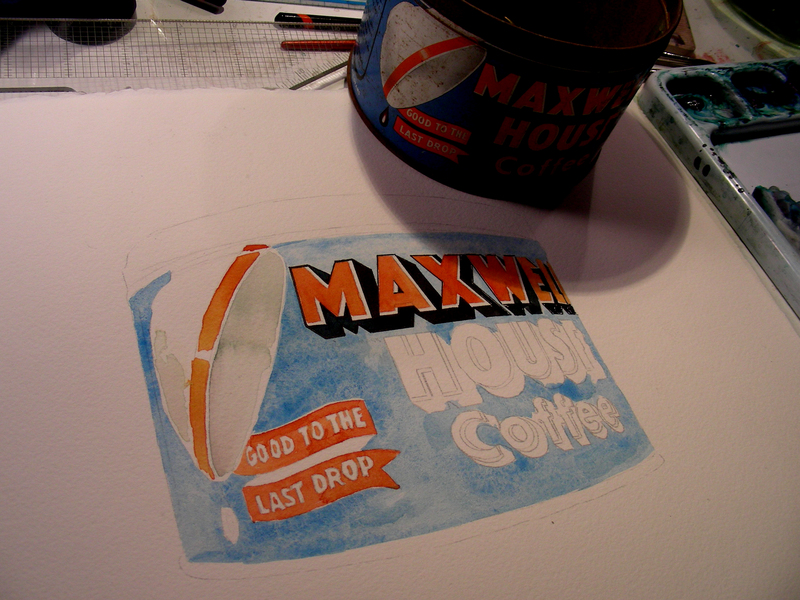 I have viewed so many splendid watercolors of ghost signs, and want to enter those ranks myself. So, I keep trying. Thanks for reading. I need to go pick up some textbooks now! Hello again. I’m settling into the mood to read, and my eyes are getting a little weary of all the close work demanded by this 12 x 14″ watercolor just begun today. The details are tight, and I’m getting tired of staring so closely at it. So, I believe I’ll put it up on the easel next to the Lucky Strike painting and see how it looks across the reading room. 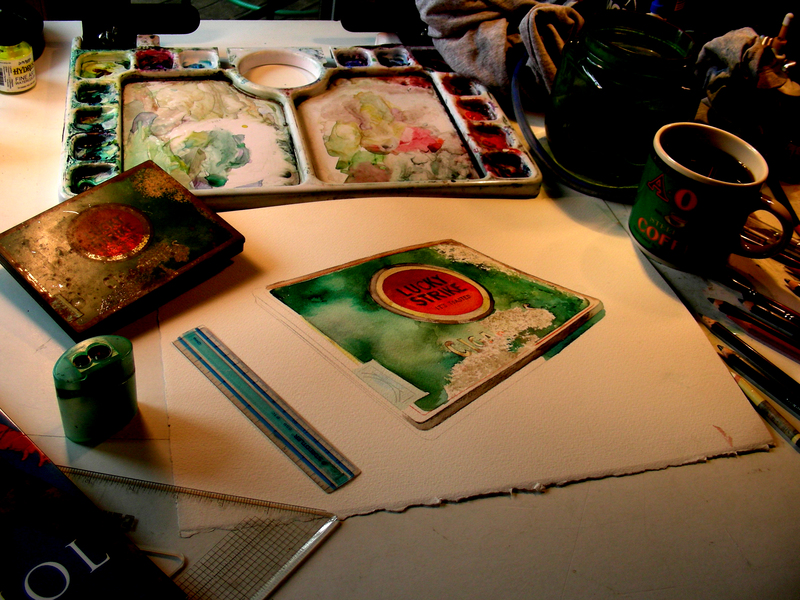 I’m surprised by this sudden obsession to paint still life objects in more exacting detail than I’ve formerly done. But I am enjoying the results. The nostalgia that surrounds objects such as these gives me a warm feeling as well. However, I have an inviting stack of books at my elbow, good things to drink, and believe I’ll shut down the art for the evening and let some of the literary muses tickle my imagination before bedtime. Good evening from the studio. As some of you know, I am now neck-deep in back-to-school Inservice meetings (some of them as interesting as watching paint dry). I am determined that school this year will not derail my blogging. I had too many excuses for my blog going on semi-hiatus this summer (all of them poor ones). I will not let this happen again. This year’s school schedule will not be the black nightmare of last year’s. I am happy to return to only six classes to teach, all of them subjects I enjoy. Andy Warhol still resonates with me. He died at the age where I find myself now (58), and this is sobering. I have not made the mark yet that I wish to make with my contribution to the artistic enterprise, and perhaps I will not. But right now, the inclination to explore and experiment is very strong with me, so I am making a concerted effort to explore alternatives while at the same time developing the genre that I have tried to anchor in recent years (and still remain a somewhat-decent school teacher). 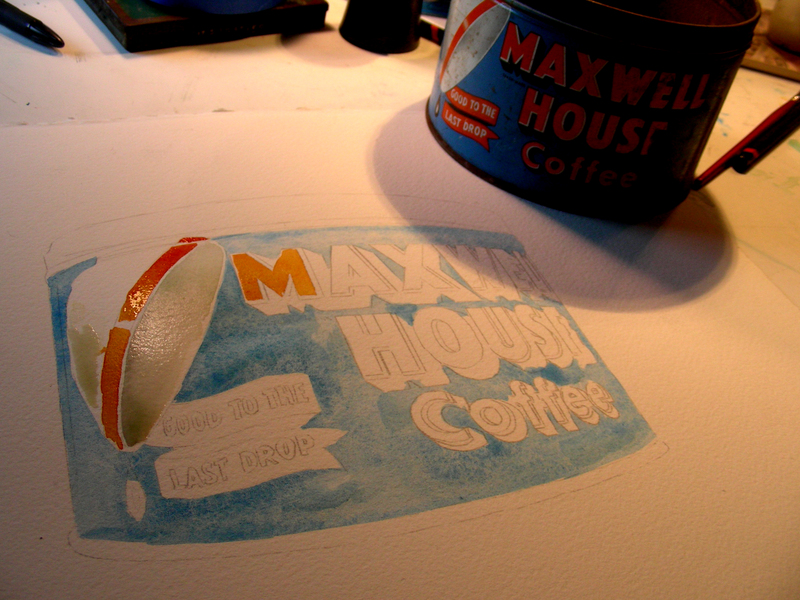 I went to the Man Cave and fished out this Maxwell House tin that I purchased a long time ago in an Oklahoma antique store along Route 66. My earliest “Proustian” childhood memories include the sound of the stove-top percolator gurgling in the pre-dawn, and my sitting in a high chair at the breakfast table, watching my father eat bacon and eggs before leaving for work as a garage mechanic. I still remember the aromas and the warmth I felt in that safe world. I don’t believe my parents drank Maxwell House (actually it was 8 O’Clock Bean) but that goofy commercial that made the percolating sounds musical will be stuck with me throughout my life, I confess. Thanks for reading. I think this painting has dried enough for me to push it further down the road to completion. I started it this afternoon as soon as I got home from school, and I hope to have quite a bit more done before retiring to bed later. In the tenth grade, we watercolored paper mache flowers in Art II. That was the first and last watercolor still life I ever attempted. This is number 2. I have had the time of my life, the past two days, playing with this. It is nearly finished. I cannot make up my mind whether the background should remain white, or if I should do something with it. The overall measurement of the page is 12 x 14″. I think I’ll return now to the Fort Worth Stockyards composition. My detour into Pop Art has extended into a second day. I cannot exactly explain how this has happened. For about a year, I have been bothered that my genre for painting has anchored in landscape and nostalgic items of architecture, signage and vehicles. I’ve been contemplating still lifes, but never made the effort until yesterday. And I ended up backing into it because of my ongoing interest in Andy Warhol and the Pop Art phenomena. For over ten years I have purchased objects from antique stores and nostalgia shops to support my Fifties interests (my company is http://www.recollections54.com), because the Fifties were my years of growing up, and my eyes were always filled with wonder at my surroundings. I read that Henri Matisse as a young boy was enchanted at the sight of colorful birds, tropical fish in bowls, and his first set of watercolors. Well, I too recall my pre-literature years and the fixation I had with commercial color schemes, most notably cereal boxes, coffee tins, gas station signs and billboards. When I first saw the Stuart Davis Lucky Strike painting, I marveled at the dark green and bright orange-red color scheme, recalling that my growing up only witnessed Luckies as a red target on a white background. 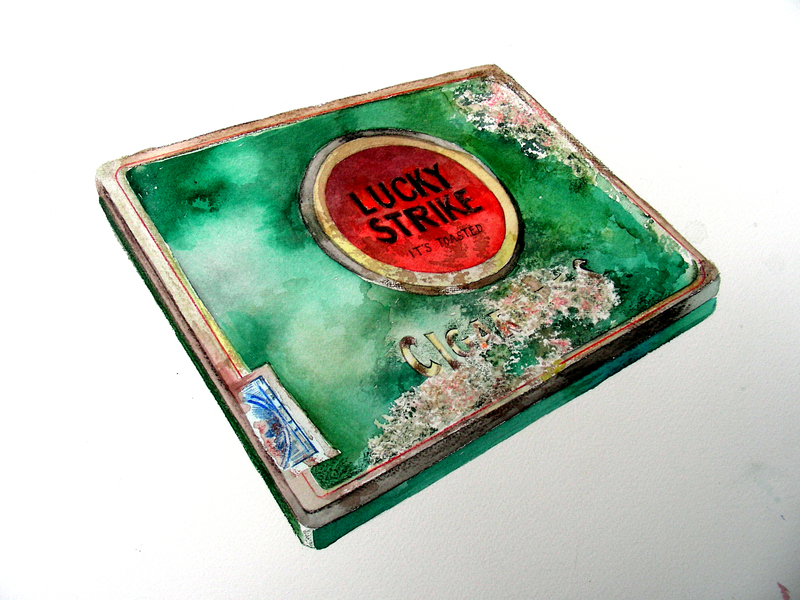 About ten years ago, I found this cigarette tin in an antique store and couldn’t reach for my wallet fast enough–there were the colors that I found so enchanting in the Davis painting at the Amon Carter Museum in Fort Worth. 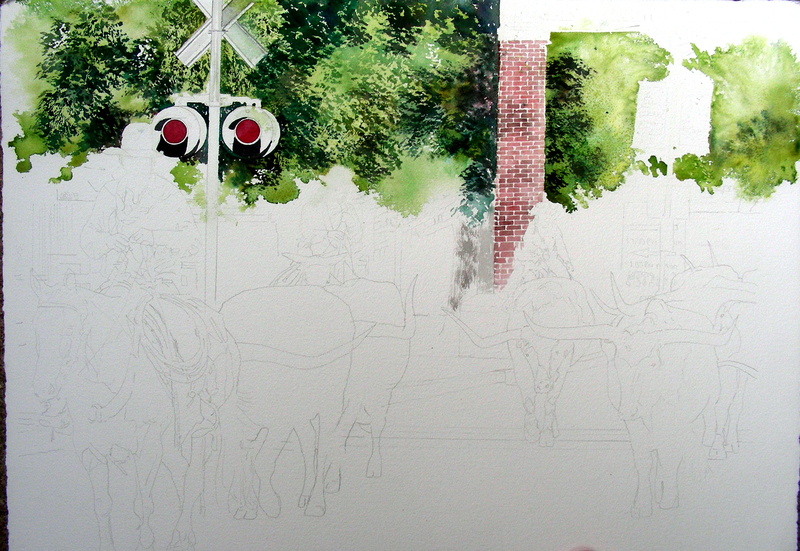 Yesterday I began this 12 x 14″ composition in watercolor, Prismacolor and watercolor pencils with occasional ink. My eye has always focused on details, colors and textures, whether I was staring at a landscape or building en plein air or an enlarged photograph. But now I am staring at a cigarette tin, hand-sized, on the table in front of me, that keeps changing as the northern lights outside my studio windows change from sunny to overcast (it’s trying to rain in Arlington, Texas at this moment; yesterday it was bright and sunny throughout the day). I am fascinated with the highlights coming off the painted surfaces of the tin, as well as the dynamics of all the rusted spots, scratches and imperfections. And I am trying to record these observations the best I can on paper with the materials at hand. And I am enjoying the experience. I have finally completed a second Man Cave environment. My garage will not be available again until probably late September (Texas temperatures are deadly this time of year). So I have moved a second drafting table to my living room, where I have an entire wall of windows to the north, providing excellent lighting. As I’ve worked today, I have listened to a 120-minute DVD documentary titled Painters Painting. The film features interviews with New York artists from the Fifties onward, including DeKooning, Motherwell, Newman, Warhol, Johns, Rauschenberg and many others. I am particularly enjoying the discussion of the shift in the art world from Abstract Expressionism to Pop. I am sympathetic to both sides, and find myself particularly anchored in neither school, as I still find my comfort zone in the realm of Regionalism as I’ve enjoyed the works of Homer, Hopper and Wyeth. But still, as a student of art history, I love all periods, and enjoy their contributions to art and the ideas we enjoy. 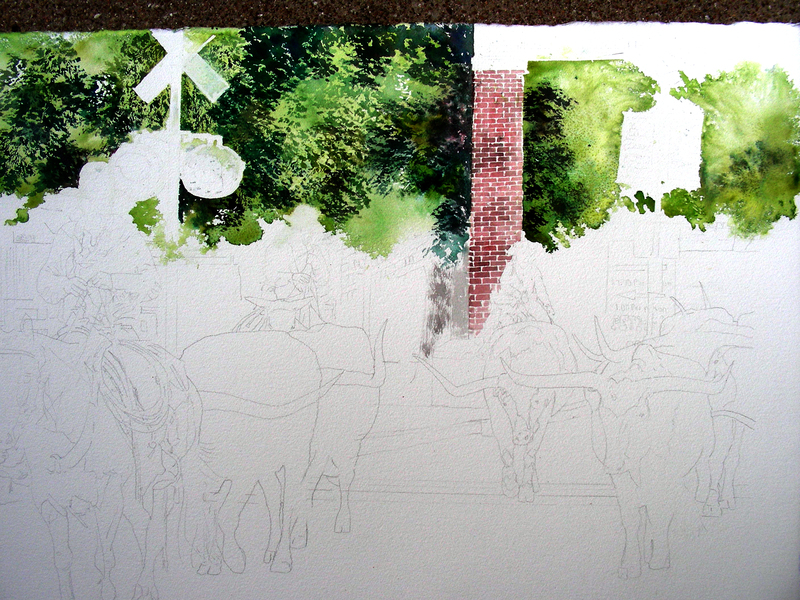 I have nearly finished the backdrop foliage for this Fort Worth Stockyard setting of a twice-daily longhorn cattle drive through the streets. I’m looking forward to the challenge of rendering the massive longhorns. Nevertheless, with them being in the foreground, I feel that my next step is working on the cowboys and their mounts. I’m also looking forward to the brick street and shadows beneath. I think this composition has real potential. This morning, I was reading the testimonies of Ivan Karp who was working in the Leo Castelli Gallery in New York City when Andy Warhol, a young struggling commercial artist, walked in with friends and purchased a Jasper Johns drawing of a light bulb. When asked if he had any “interesting new work” on hand, Karp took the young artist into the back room to show him a recent piece by Roy Lichtenstein. Warhol’s response: “My goodness, I also have things that look like this in my studio! Would you come to my studio?” Karp showed up at Andy’s townhouse the next morning and got his first look at the young artist’s commercial images. He marveled when he saw the disjunctive between Warhol’s splattered, dripping abstract expressionist-influenced renderings of commercial products on one side, and his clean, tight copies of images on the other. Karp and Warhol that day both decided that the cleaner images were the better paintings. As I continue to read daily about Warhol’s development, I realize that my own enterprise as an artist has been nostalgia, yet my recognizable subjects from the past are cast in landscape genre, not still life. So . . . today I decided for the first time to peruse my collection of antiques and find something to paint up close and personal, with no landscape to house it. 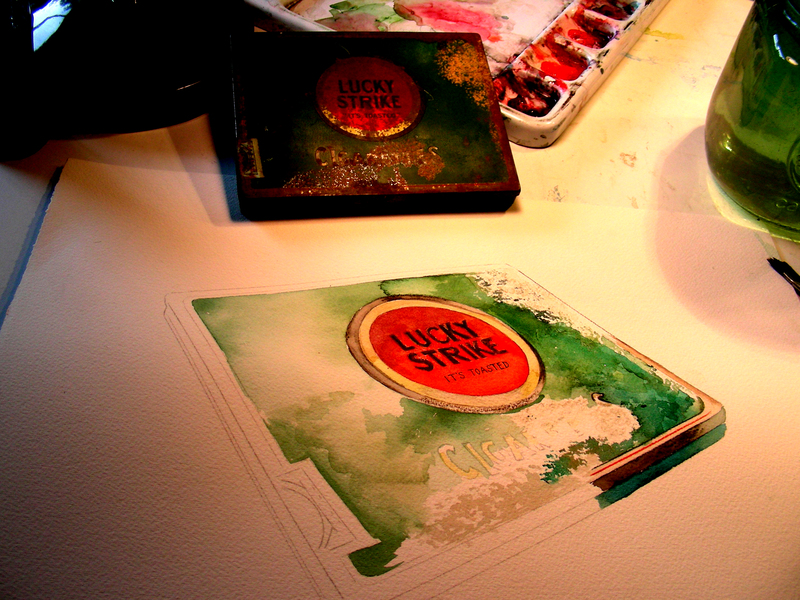 I found this old Lucky Strike tin that I purchased about ten years ago and thought “What have I got to lose?” And I’m having a genuinely good time messing with this. I’m not sure when I’ll return to my Colorado hotel or to my Fort Worth Stockyards. For the moment, I am re-living Pop. Today has been given mostly to studying the tree cover behind the Fort Worth Stockyards and trying to find ways of matching my pouring, masking and drybrushing efforts to the colors and textures there. This has meant hours of masking, pouring, removing the masking and re-masking new areas, drybrushing, salting and occasionally sandpapering. I seem to spend more time staring at the photographs and painting than actually painting. During break periods, I have been reading and reflecting with great satisfaction over the Collected Writings of Robert Motherwell. I love this man’s intellect, his aesthetic and his way of analyzing trends in art history. I have also enjoyed reading from this huge coffee table volume: Andy Warhol “Giant” Size. I just finished reading the first two chapters, and am fascinated with his overall life, his taking the New York advertising scene over by force, and especially his idea of opening the Factory. 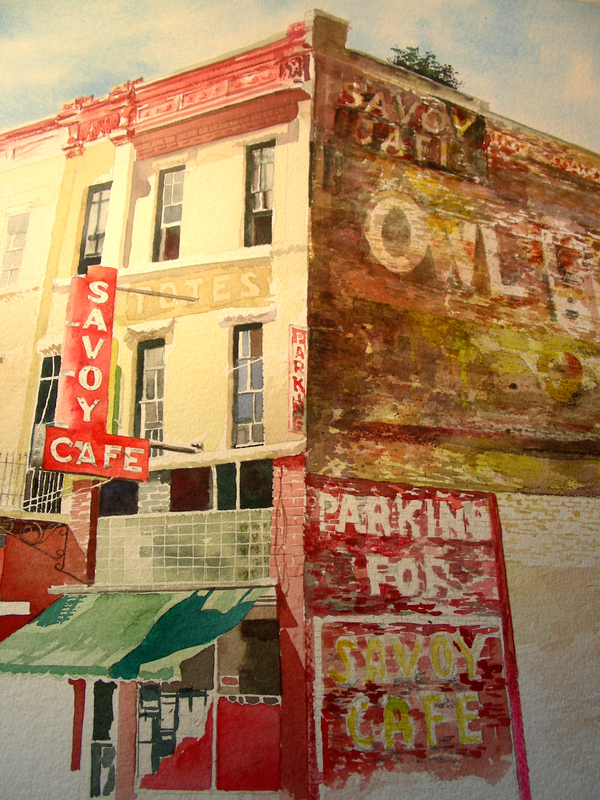 While allowing my Savoy Hotel painting to lie dormant for a day, I decided to go ahead and pour the background trees in this 22 x 28″ watercolor of the Fort Worth Stockyards. Last week, for the first time in my life, I drove over there, sat in the 105-degree afternoon, and waited to see the longhorns driven down West Exchange Street. It was worth the wait. I have a little experience painting horses (very little), and zero experience painting livestock. But, we’ll see how it goes. 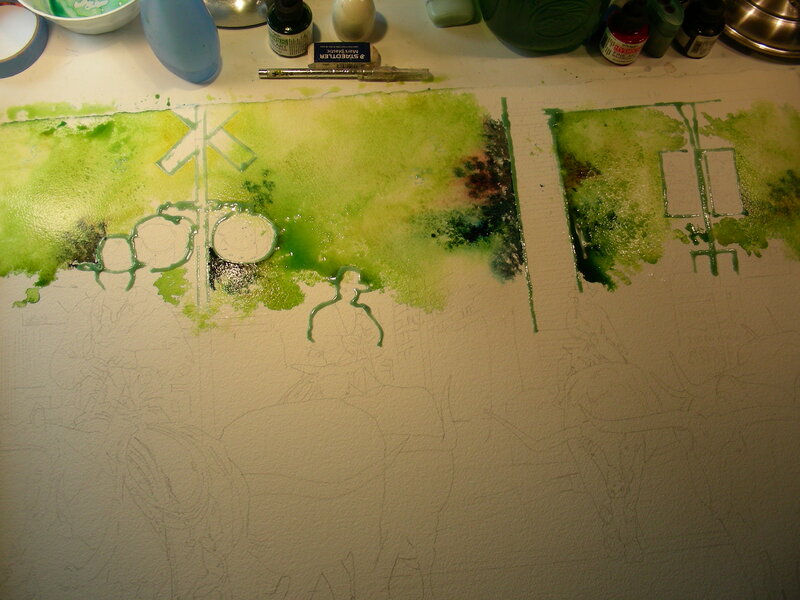 First I have many layers to pour in order to lay in the background foliage. I’ll be at this one for awhile.